In order that you as presenter can relax and observe the successful course of your own ball, we take care of the artistic concept - ball orchestra, band, opening dance couple, dancing master and midnight interlude. In addition, we will gladly advise you regarding the selection of an appropriate venue, the optimal sound system and put together with you a successful night at the ball. We have many years of experience in this field and will see to it that your ball turns out to be an unforgettable celebration. In Vienna, balls are among the most beloved forms of social activity, there, business and politics are set aside - experience the Viennese zest for life in three-quarter time, in the splendid ballrooms of the city of music. At you ball, the "most beautiful dancing master in Vienna" announces "Alles Walzer" for you - the traditional signal to let the waltz begin! The "Viennese Ladies Orchestra Johann Strauss" exudes the joy of the waltz and sets the mood on the dance floor, Gerhard Aflenzer & His Broadway Big Band provide for the international sound and a few Sinatra hits. Ball/International Dance Music offers you fantastic, compelling bands. Based on our many years of experience, we have decided to offer the most beautiful Viennese Ball and the one which has enjoyed the most international success, as a package under Our Special - the Viennese Ball. 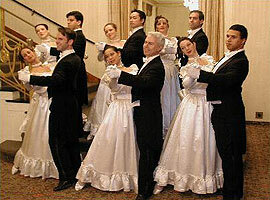 There you will find a complete program for your event with our artists from the section "ball". Under Your Ball à la Carte you will find the complete artistic offerings from the section "ball". There you can put together your own personal ball entirely according to your own wishes - moreover, we can of course accommodate your special requests. We will gladly prepare an individual proposal for you, free and without obligation - to save you time, we have drawn up a thorough questionnaire for you. Contact us, we look forward to welcoming you and your guests. Under Downloads, as a special service to you, we have compiled the texts, photos and listening examples pertaining to all the artists under the heading "ball". We invite you to download your choice of data, free of charge and at your own convenience.